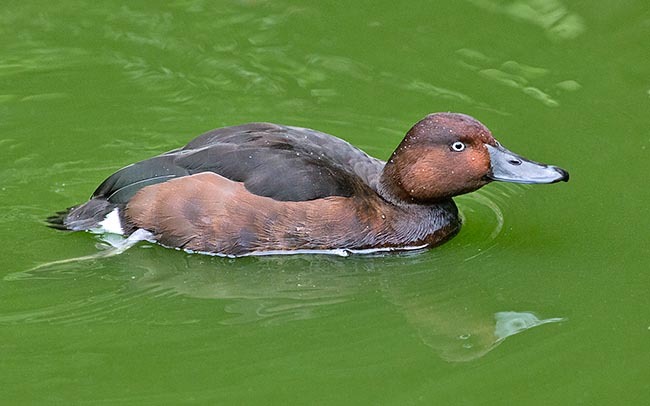 The ferruginous duck (Aythya nyroca Guldenstadt 1770) is a duck belonging to the order of the Anseriforms (Anseriformes), to the family of the Anatids (Anatidae), to the genus Aythya and to the species: Aythya nyroca. It is a monotypic species. The name of the genus “aythyna” comes from the old Greek term “aithuia” that might refer to a sea duck or to the razorbill. 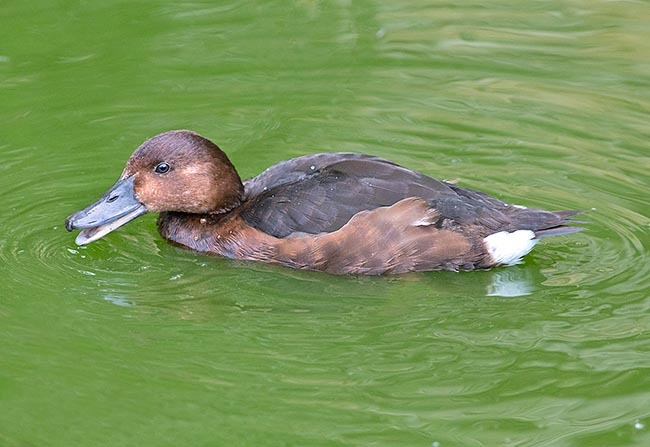 The name of the species “nyroca” comes from the Russian “nyrok” which means duck. It is present at the temperate latitudes of the central and western Paleo-arctic region: from Western Europe to western China, in western Mongolia and in northern Iran and Lithuania. This species has a numeric consistency and diffusion variable in relations with the more or less optimal conditions of the reproductive areas. The distribution range appears particularly fragmented and unstable in the western marginal parts. In Italy, the species has a restricted distribution with few pairs probably nesting in Friuli-Venezia Giulia, Veneto, Emilia-Romagna, Tuscany, Lazio, Puglia and Sardinia. 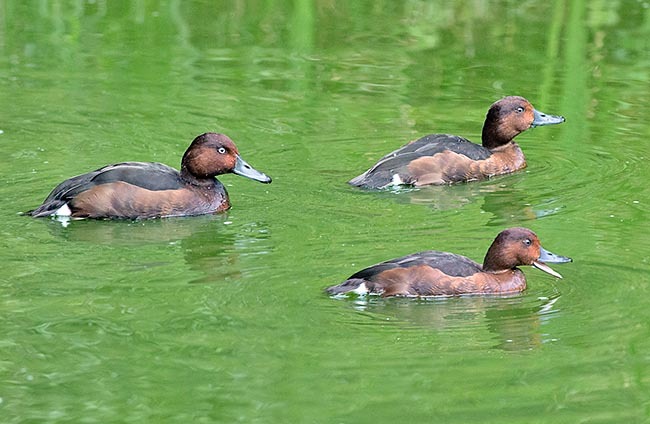 The ferruginous duck is a migratory species with a part of the population dispersive or partially sedentary in the southern parts of the distribution area. The northernmost nesting areas are abandoned between September and October; in the wintering quarters the first arrivals take place already by end October and go on for the whole November. The departures take place between March and April, with individuals, presumably not nesting, in movement also in May. The main wintering areas are located in the Mediterranean-Black Sea zone and in Western Africa. In Central Europe the wintering appears scarce and localized. Everywhere, the concentrations of wintering ducks are not important numerically. This, along with the reserved habits of this species, renders difficult the censuses. The nations hosting the most important fractions of the wintering contingents are Rumania, Egypt, Sudan, Yugoslavia, Croatia, Kazakhstan, Uzbekistan, Azerbaijan (which host some thousands of individuals), western Russia, Bangladesh, Mongolia, Turkmenistan, Mali (which hosts even thousands of units). Italy is a poor wintering area for the species. It is estimated that there is a total of 14.000-21.000 nesting pars and an overall population of 40.000-70.000 specimens. Unluckily, the species shows everywhere a constant tendency to the contraction of the range with the complete recent disappearance from some areas of past presence. This is alarming also because at the beginning of 1900, this species was described as one of the most abundant ducks. During the reproduction time it frequents fresh water swampy zones with average deep bottoms and rich of marsh vegetation, submerged as well as floating and emerging. It loves the pools of stagnant water on whose banks grow thick belts of carex and reed mixed with scattered trees and shrubs. If necessary, it adapts to slightly brackish waters such as coastal pools and lagoons. Le places of regular nesting are usually located at the sea level. In the zones with internal waters, instead, the presences are occasional with the frequentation of maximum altitudes of about 1000 m.
Outside the reproductive season, it frequents and stops on natural and artificial expanses of fresh water, in lagoons, brackish ponds and, to a lesser extent, in coastal marine waters. Usually, it avoids deep and oligotrophic waters, the humid zones characterized by recurrent variations of level and the fast water streams. It is a monotypic species with modest and compact dimensions (it is the smallest duck). It is 38-42 cm long, with a wingspan of 63-67 cm and a weight of 410-685 g (the males being little heavier). The sexes are fairly distinguishable even if they do not have very marked differences. In the male the head, the neck and the chest are dark brown and the sides are fawn. The upper parts have also colour shades with reflections of bright mahogany-purple-violaceous chestnut (it is also known with the name of “caramel duck”). The upper coverts of the wings, the rump and the flight feathers are more brown-dark. The wings have shades of dull green with an ample white-brilliant wing span, evident when flying (greater than the tufted duck, Aythya fuligula) and remiges with dark apex which, in the whole, border the wing. The undertail is white and the abdomen is bright white with shades in darker hues towards the undertail, these parts, along with the under-wing, always clear, are very evident when the bird is flying. A small white-fawn spot is present on the chin and a dark brown collar at the base of the neck. The beak, rather long (37,5-43 mm) is slate gray with paler extremity and margins. It has a typical high front, with a sort of a “small raised crown” on the vertex of the head. The legs are olive-grey with black inter-digital membrane and an about 29-36,5 mm long tarsus. The iris is white-very clear yellow. In the females the general tonalities of the plumage are browner and duller than the male. The beak is opaque blackish with grey margins and apex. The legs are similar to those of the male but are more opaque. The iris is brown; the colour of the eye neatly different between male and female allows distinguishing the sexes all the year round (even with the eclipse livery). During the eclipse period the male tends to resemble the female but its head and chest are more reddish and paler tonalities on back, neck and cheeks. The brightness and the white of the iris and of the undertail remain unchanged. The female, in this period, assumes paler shades. The juveniles resemble the female but have more uniform livery on the upper parts. The head, neck and chest are dark brown with barely perceptible reddish shades. The abdomen is spotted of white and brown, the undertail is speckled of brown. The young has grey-bluish to grey-black beak with paler base. The legs are bluish grey with opaque black webbings. The iris is grey-brown; during the first winter it becomes brown in the female and pale grey in the male. There have been reported cases of hybridization with various species belonging to the genera Aythya, Anas and Netta. Small duck with very fast flight which can easily take off after a short run over the water. When flying, it is evident the bright white of the ample alar belt and of the undertail. Poorly gregarious species and usually silent outside from the reproductive period; the vocalizations of the female are louder and harsher than those of the male. It swims rather raised on the water with the tail slightly elevated which evidences the white colour of the undertail. 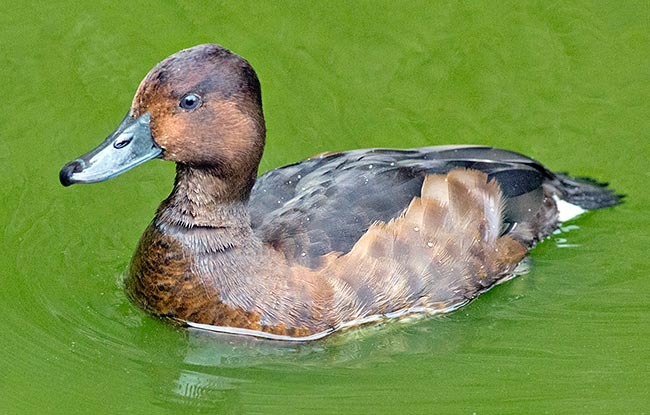 The ferruginous duck is markedly aquatic and loves stopping in shallow waters where it swims and dives with agility looking for food. It is particularly active at dusk and nourishes also during the night. It east mainly seeds and parts of aquatic plants of various genera (Potamogeton, Ceratophyllum, Carex, Chara, Lemma, etc.) which it gathers diving partially or totally or swimming on the surface in bottoms of usually 20-70 cm of depth. It nourishes also of small animals such as small fishes, amphibians, annelids, molluscs, crustaceans and insects found always in the aquatic habitat. It lives solitary, in pair or in small groups of less than a ten of individuals. It is of shy nature, does not tend to mix with ducks of other species. During the winter it can be temporarily gregarious uniting in flocks, with huge concentrations of specimens, in favourable locations. During the reproduction period, the species forms seasonal monogamous pairs. 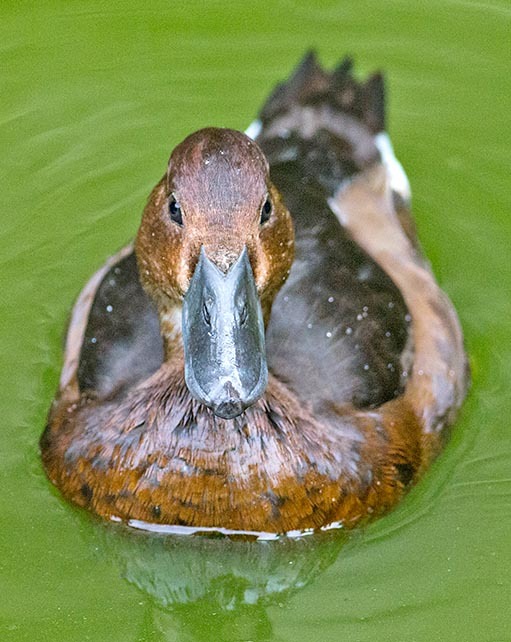 The ferruginous ducks build nests isolated in the thick of the swampy vegetation growing on a solid substratum or in the water. The nest is a low structure formed by fragments of reeds, leaves and grass covered by down. When they are not put directly on masses of swampy vegetation, the nests are placed on islets, very close to the water. The first spawning should take place during the third decade of April with delays up to the first week of June. The brood is, as an average, formed by 8-10 eggs (6-14), of short oval shape, of cream-grey-greenish colour. Their average size is of 53 x 38 mm (48-60 x 35-43) and average weight of 36 g (31-41). The annual brood, if lost, can be eventually replaced. It’s the female who cares, alone, the eggs; the incubation lasts 25-27 days. The pullets are nidifugous and they are immediately very skilled in swimming under water moving rapidly in immersion in order to escape possible predators. The ducklings are, overall, rather dark (smoky brown): they have vertex, rear part of the neck and remaining upper parts grey-dark brown with accentuation of the dark hues on the low back. They have elongated filoplumes, apically coloured in olive yellow, on the head and the back. Present are yellow spotting on the wings and on the sides of the back. Throat, neck and central parts of the abdomen are pale yellow. The upper rhamphotheca is brown-dark olive, the lower one is horny or pale fleshy. Blackish legs with olive yellow marks. The iris is brown. The young are able to fly when 55-60 days old, the sexual maturity is reached by the year of age. The species results endangered due to: the loss of habitat, the climate change which increases the drought, the hunting, the pollution, the lead poisoning, the drowning by entrapment in the fishing nets, the introduction of alien species, human derangement. For this species do exist local and international plans of safeguard which interest the countries hosting the species. Fuligula nyroca, Fulix nyroca, Nyroca nyroca.